Overall, Return Fire is a phenomenal game and the first title this year to receive a score of "10" from VideoGames. This game is absolutely begging for a sequel with more new vehicles, weapons and scenarios. This may be the so-called "killer app" that the 3DO platform needs to convince those holding out for a 32-bit system. It sold a few friends of mine. Return Fire fait partie de ces quelques perles qui se battent en duel au milieu des daubes sur 3DO. Fledgling 3DO developer Prolific Software shows that it's passed programming bootcamp. This stunning combat simulator displays a great sense of history - and humor. As a one-player game against the computer it wears thin after a while, but the split screen two-player mode is a party game from hell! You have no idea what a ruckus this game caused in the office! Destroy, destroy, destroy! If you own a 3DO then you probably already own this game. If you have a 3do, but DON'T have this game, then you wasted your money. At first I found Return Fire extremely fun as I zipped around blowing up everything in sight to perfectly matched classical tunes. However, after going this far an extended amount of time, against the same background, I became weary and wanted more! Thankfully, the 2-player game is funner than the hot place. After annihilating Kid Fan, I found RF a worthy investment. Action-Feldzug mit vier verschiedenen Fahrzeugen und schlauer Steuerung: Das härteste Kriegsspiel auf dem deutschen Markt. Return Fire is a blast even in the one player mode offering plenty to see and even more to destroy with a two player mode that is sure to split friendships due to its fiercely competitive fun. If you're a fan of military action that never takes itself too seriously, then check out Return Fire as soon as possible. Not being a big fan of war simulation games, I was pretty impressed with Return Fire. Although the graphics were dithered, it didn't detract from it's fine play mechanics. Unlike most games, it's full motion video was not the main emphasis. The music and sound effects totally get you into the game. War sim fans will love this and casual gamers will not be disappointed. Not bad. Un must have sur 3DO : Un excellent jeu de destruction qui prend toute son ampleur à deux joueurs. Quoi de mieux que de jouer contre un adversaire humain et voir ses véhicules exploser sous la pluie de roquettes que vous lui balancez sans répit ? Je peux dire sans problème que RETURN FIRE est un des meilleurs jeux auquel j’ai joué, principalement par son coté multi extraordinairement prenant. Le rapport simplicité / plaisir de jeu est bien là, pas besoin d’un soft bien compliqué avec 30 boutons à gérer en même temps pour prendre son pied. Enerverende maar af en toe rommelige wargame. Bijna onbeperkt knallen en vette filmmuziek, maar op den duur toch eentonig. Helaas dus allemaal niet wereldschokkeld, maar dank zij de uitermate spannende muziek wordt dit knap verhuld. 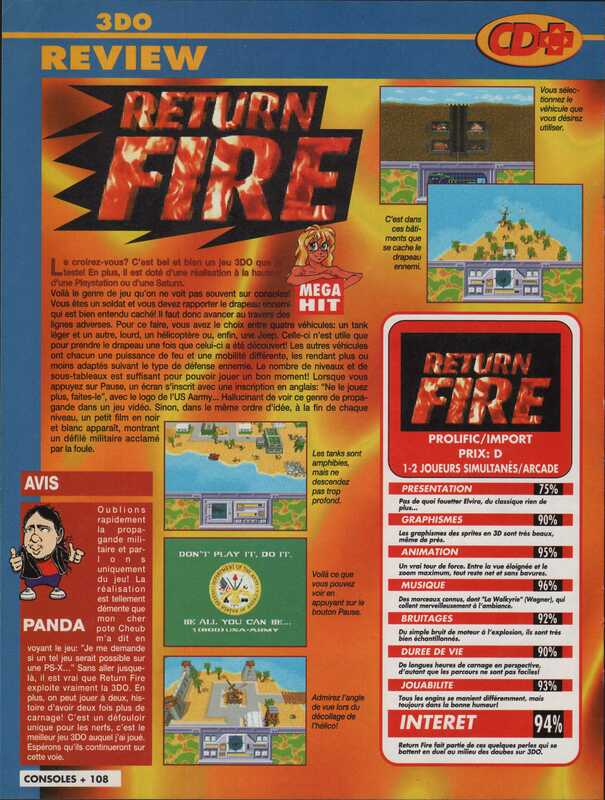 "Return Fire" for the 3DO is arguably one of the finest two player games out on the market. I played Return Fire when it first came out back in mid-90's, and again recently with a group of friends. In both cases, it was an under-whelming experience. Still, I can understand why people were excited about Return Fire back in the day. The game's slick presentation, scaling cameras, and satisfying explosions were certainly impressive for its time. Add in surround sound, an orchestrated soundtrack, and vintage video clips, and it's almost enough to make you overlook its tepid gameplay. But not in 2006!